Can Disneyfication save a Chinese City’s Poetic Soul? Chinese cities are often contradictory bricolages of old and new. They wrestle with extraordinarily rapid rates of economic growth, concentrated urbanisation, the growth of a burgeoning middle class as well as extreme social, political and economic disparities. With accelerated urban development and an intensified race for global recognition, historic “traditional” hutong neighbourhoods are being evacuated. They are replaced by what scholar Aihwa Ong calls “hyper-buildings,” built to increase exposure for and promote the district, city and its new commercial development. These represent the architecture of consumption: office towers, apartments, shopping centres. But what is most peculiar about this kind of development is the frequency of what has been called “duplitecture” – buildings that imitate global landmarks and styles. These faux “authentic” historic structures provide Disney-like plastic effigies to an abandoned generation. A simulation of the UK town of Dorchester houses 200,000 citizens in Chengdu. Likewise, Thames Town in Shanghai, a clone of Austria’s Hallstat resort in Huizhou, a replica of the Eiffel Tower and the Champs-Élysées square in Hangzhou all offer “luxury” and exclusivity. Nothing, apparently, has been learned from Las Vegas. Owning and investing in these plastic facsimiles of “progress” becomes a simulated enactment of status amongst China’s emergent nouveau riche. And with duplication comes risk. Serial replication is likely to result in standardisation. This results, eventually, in what scholar George Ritzer would call the (re-)creation of nothing. Yet if you venture behind the sanitised façade of these superficial simulations, the poetic, culturally rich, authentic spaces and peoples are there. 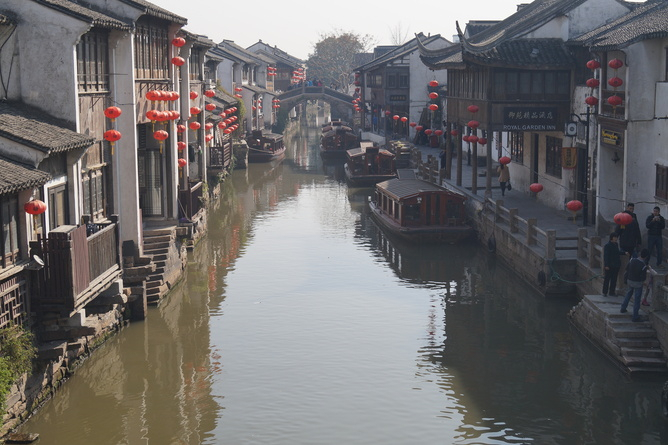 Our current research has taken us to the city of Suzhou, Jiangsu Province. The Suzhou Industrial Park (SIP) gleams as a proud beacon of Western progress. An array of depthless and detached copies dominate the wings of rapid urban sprawl: the current peripheries of Suzhou’s urban anatomy contain a currently dormant Dutch Town, a super-sized Tower Bridge (London), copies of Sydney Harbour Bridge, the Pont Alexandre III (Paris), and a Venetian inspired outlet village. These sit alongside, however uncomfortably, a sensuous symphony of everyday urban life. Young women carefully assemble washing powder, clothes and dip metal buckets into one of the thousands of wells that sink into Suzhou’s ancient waterways. The sound of laborious scrubbing blends with a cacophony of car horns, the burr of scooters, the squawk of live chickens and vendors on the narrow Shantang street. 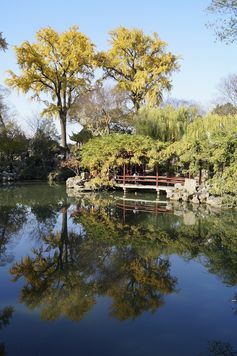 There is the gentle swish of water from a passing “leaf boat” couriering produce and passengers to the leaning Pagoda on Tiger Hill, and the wistful sound of the erhu – a two-stringed bowed instrument – emanating from the ancient setting of the city’s famed Lingering Garden. You could think of these gardens as Suzhou’s soul. Nine of them are UNESCO listed world heritage sites. The giant wings of hyper-buildings and hyper-bridges soar from this quiet centre, this historic ornithological body. These protected gardens offer tranquillity from the hustle of the narrow pavements that line the ancient waterways of the city’s historic heart — the “street” map of this “Venice of the East” remained unchanged for some 2,500 years. Suzhounese cuisine, opera, Pagodas, the I-M Pei designed Suzhou museum, and an overwhelming friendliness offer an urban poetry that exudes calmness and distance from the frenzied speed of capital flows. Suzhou may have won the 2014 Lee Kuan Yew World City Prize. But this does not mean that it has escaped the extraordinary rates of urban growth of other Chinese cities, and the traffic congestion and internationalisation that comes along with it. Yet, unlike other Chinese cities, administrators are seeking to preserve its poetic soul. In the face of a culture of fastness, Suzhou is turning to the culture of slowness, inviting visitors to savour the city. The importance placed on the central 2.5 square km historic district, the promotion of boutique hotels, the preservation of historic streets and ancient waterways, all contribute towards this. And the planned tours that encourages tourists to engage with the culture do the same – whether fruit picking, crabbing, lambing, tea picking, or practising t’ai chi with residents. The city is strategically positioning itself differently, unlike so many of its Tier 2 city peers who are engaged in the active destruction of the past, of tradition and of culture, as a unique heritage destination. For while there might be examples of remote pockets of preservation that emphasise a China before modernisation, Suzhou planners are attempting to both manage heritage alongside the intensified growth strategies of a Tier 2 Chinese city. But important questions remain when the past becomes manipulated in the interests of capital, when cities reposition themselves for the global tourist market. Worrying questions about who controls historical knowledge and what is distorted are raised. In a way, the survival of “something” from the past results in Disneyfication too, as maximum economic value is extracted from an “authentic” historic core. The ironies of this are heartbreaking. Failure to extract economic value from heritage could mean that the juggernaut of global capitalism will swallow all but the most protected in Suzhou. But perhaps preservation requires a degree of Disney. And this is surely better than the total annihilation of the past. Michael Silk receives funding from the Jiangsu Provincial Government to explore overseas tourists’ experiences. Andrew Manley receives funding from the Jiangsu Provincial Government to explore overseas tourists’ experiences.